Kathy Terry is a senior researcher at AIR. Dr. Terry serves as the state manager/liaison for North Carolina as a part of the Southeast Comprehensive Center. 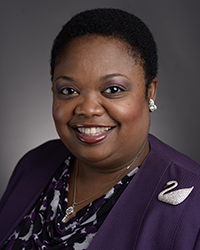 In addition, Dr. Terry provides evaluation capacity building services and technical assistance to state departments of education served by the Southwest Regional Education Laboratory and the Southeast and Texas Comprehensive Centers. She also serves as an evaluation task lead for the Illinois Quality Afterschool project. Dr. Terry serves as a technical assistance provider and trainer on the Concerns-Based Adoption Model (CBAM). In this role, she trains school district administrators and teachers on how to utilize CBAM when implementing new innovations in their districts and schools. Dr. Terry’s qualifications include evaluation capacity building, school-based and district-level program evaluation, student performance data analysis, focus group protocol, and survey development. With more than 18 years working as an education evaluation researcher, Dr. Terry has experience with all aspects of evaluation studies. As a consultant in Michigan, she served as the local evaluator for the federally-funded 21st Century Community Learning Centers (CLC) in the School District of the City of Highland Park. In this capacity, she was responsible for conducting site observations, supervising data collection, and generating a year-end technical report. Prior to joining AIR, Dr. Terry was a research specialist for the Houston Independent School District, where she designed research evaluations for school-based and district-level programs, such as the Home Instruction of Parents of Pre-School Youngsters (HIPPY) program, the 21st Century afterschool programs, and the effectiveness of educators trained by Teach for America. During a post-doctoral fellowship at the University of Michigan in Ann Arbor, she co-directed a randomized controlled trial for the Pathways for Success program (formerly named School-to-Jobs program) in Detroit Public Schools.